Yeah, but those are different track styles IRL. The Giga coaster is Intamin track - adding another Intamin track style means creating a duplicate. Also, the game frequently reuses sprites for similar track styles (Junior/Water, Looping/LIM, Mini/Spiral etc), so I don't think adding an entirely new track style for a very similar track like Mack or Gerstlauer is really justified either. Right now, I'm concentrating on my Intamin double-spine track. I also have RMC IBox track in development, but there are so many issues with that that it might never be completed. Maybe. I actually already tried this, but it doesn't work out of the box. Track sprites are split into the parts that should draw behind the train, and those that should draw in front of it, while scenery sprites are not. If you just make a track piece into a large scenery object by the normal process, you get severe graphical glitches. In theory, you could work around this by fudging the clearance heights to trick the game into drawing the sprites in the correct place. But now that we can create actual track pieces, that seems like more effort than it's worth, and it's likely to cause more sorting issues if you have other scenery pieces (like supports) near the track. There is no CSS17 in RCT1 Folder! How to get RCT1 Music? See this similar question on Reddit. Chances are you don't want the custom track, but here's the link if you really do. I noticed today that one important file isn't included to that repository, so if you actually intend to try and install it I'll have to correct that. It's cooperative - all players work on the same map together. The process for creating a new track element for an existing track (there are extra steps if you are looking to add an altogether new track style) looks like this: Create the sprites. This is the hard part. Place the sprites in the appropriate subdirectory of resources/g2/track/ (if there isn't a subdirectory for the new track type, create it. It doesn't actually matter where they go, but it's a good idea to keep the sprites organized). Edit /resources/g2/sprites.json and add entries for the new sprites. Run "make g2" to generate a new g2.dat file. Edit src/openrct2/sprites.h and add symbolic constants for the new sprites. You can skip this step, but it will make rebasing very tedious if any new sprites have been added to develop since you started development of your new track elements. Add the code to draw the element. The track drawing code is found in src/openrct2/ride/coaster - most of the time you can just copy the code from a ride that already has that element, and just change the sprites. Also make sure to modify get_track_paint_function_* (at the end of the file) to let OpenRCT2 know about the new track. Finally, you need to alter src/openrct2/ride/TrackData.cpp to add the new track element to the list of supported track elements for that ride (this is stored in RideTypePossibleTrackConfigurations). If you don't want the track element to be available to build without cheats, you can skip this step (if your track piece requires sprites that vanilla trains don't have, and you intend to submit it for inclusion in the official release, the developers will probably not want it to be available without cheats). Really, if you can just create sprites that look good I'd be happy to help you with getting them in the game - as I mentioned above, I had a go at implementing this myself and the only thing I really struggled with is making sprites that go well with the vanilla ones - I already have this working, it just doesn't look very good (for the screenshot above, I replaced all the vanilla track as well, just so that the new ones wouldn't look out of place). The spiral coaster is a Schwarzkopf Jet Star/Speedracer model. I think what OP is referring to is Schwarzkopf's travelling looping coasters that had a tire drive lift (Dreier Looping, Thriller, etc). You could argue that this should be a separate ride type as there are some differences between the Schwarzkopf loopers that have tire drives and those that have a chain (such as a slightly larger track gauge and a different style of wheel assembly). However, the differences are too small to be noticed in game. I think it would be better to add a tire drive track element to the existing looping coaster (though this may require a new save format). I understand what you mean now, but I can't really help you. It's quite a specific requirement, I'm not sure anyone has looked into it. What you can do is leave some scenery slots unfilled, and add scenery items later as you need them. This still requires you to know which scenery items are required to build your design, which the game doesn't show you. That might be a nice feature to have. These are usually called "workbenches". You can find some on NEDesigns. If you don't want custom scenery look for ones that say NCSO. You can also create your own in the scenario editor. Yes - you can't have a non square map, but you can hide parts of the map that you don't want. Because they place black scenery objects over it which have the same color as the background. This gives the appearance of having a non square map. It's not that the game implements a cap on booster speeds - it's that there's a finite number of possible settings (IIRC it's a 5 bit value, so 32 possible settings), and the same booster speed setting will be interpreted as different speeds depending on the ride type. You'll notice that on the ride types that allow faster boosters, the increment between them becomes larger. In principle it would be possible to increase the maximum booster speed on the junior coaster but this would be a non-backward compatible change. A new save format would remove the limit entirely, but it's a long way off. For now, if you want faster boosters than the junior coaster offers, you have to use a different ride type. But you can still use junior coaster track - it's the ride type that matters. Just make the ride a twister coaster and then merge onto junior coaster track. You can then make the station invisible and build junior coaster track over the top with zero clearance, so the whole thing looks like junior coaster track but still behaves as a Twister. 64 pixels across, 32 pixels high. You could find this by looking at a screenshot of the game in an image editor. Fork the repository on Github, make your changes and commit them. Then there should be a button on Github that says "compare and pull request". As far as I'm aware, no one has made an actual custom ride entrance (custom park entrances exist). Support for this was added less than a month ago. Up until recently, the list of ride entrances and exits was hardcoded and the sprites were loaded from g2.dat. Creating a functioning custom entrance would mean modifying the code, so people would instead just make the entrance invisible and then place custom scenery over the top. When the new object format was implemented, it became possible to add new object types, and a PR implementing support for ride entrances and terrain types as custom objects was merged a few weeks ago. I haven't had much of a chance to experiment with this but I'm pretty sure this means it's now possible to make a functioning custom entrance. However, be aware that JSON objects will not export with your savegame, and they will only work in OpenRCT2. You won't find them in the vanilla ObjData folder because entrance objects didn't exist in vanilla. You need to look at the JSON object files instead. Where these are located on your machine may vary, but you can view them all on Github. The sprites can be found in g1.dat - I believe you can use OpenRCT2 to extract these into PNG files if you want to use them as a reference for your custom object. No object editor will have support for custom entrances/exits because they weren't a thing until recently. However, it's not really necessary - the new JSON objects are based on standard file formats and can be edited with standard tools. Each vehicle type is a separate object file and therefore a seperate research item. I don't think this was different in vanilla, and I don't believe there's an option to unlock all vehicle types automatically whenever one is researched (the scenario might not even have all vehicle types available). However, there is a cheat to let you edit the inventions list (and object selection) in game. You can use this to make whatever vehicle types you want available whenever you want them. That's why it's considered a cheat. In most cases, no chain lift is drawn because there's no sprite for it, it just makes the track piece behave as one. It's straightforward to replace the chain lift sprites with tire drive sprites (the Junior coaster already has tire drive lifts that work this way). But it only makes sense to do this on coasters which only use tire drive lifts, and there aren't many of those. I don't know if it is possible to add a new flag for tire drive lifts before the new save format (but it probably isn't). Edit lines 46-58 in this file. You don't need to do any coding to rename an object. Custom objects should be placed in your OpenRCT2/object folder. If you don't know where that is located, I believe there is now an "open custom object folder" button in game, but I can't remember where that option is (I'm currently running a modified version of the game that doesn't have it; I'll have to check later). As long as you haven't already maxed out your object selection for that park, yes. I think because you're playing in Dutch, it might not be a word-for-word translation. It looks like "Disable height controls" is the one you want - try it and see if it works. You can get the code here (or at least, a slightly earlier version of it - this one doesn't have half loops). However, this is the RMC IBox track not the Intamin (the code is the same, I just change the sprites). I could upload a zip file with the Intamin sprites if you really want to try it. I have a program that takes a 3D model of a straight section of track and transforms it to create a model of each track piece, then renders the sprites from that. That code is here. Once the sprites are rendered, some boilerplate code needs to be written to get the game to use them, but that can mostly just be copied and pasted from another ride. The giga coaster definitely needs inversions. Unfortunately, it's difficult to add them, and not for any technical reason - it's just really hard to make sprites that match the existing ones. 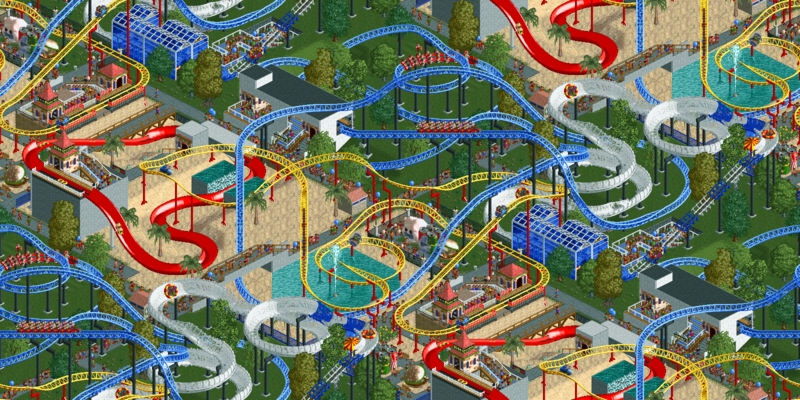 I have a custom version of the Intamin track with vertical slopes, half loops and barrel rolls, and it looks OK as long as you only use custom sprites: However, if you keep the original sprites and only use the custom sprites for the new track pieces, then they look awful (this image is an older screenshot so the shading has been adjusted since, but the lack of contrast remains). So, I can easily add a new track style but I can't really extend an existing one. I've thought about submitting a PR for the extended track, but I think creating a new track that looks the same as an existing one is likely to cause confusion, especially if OpenRCT2 eventually gets an open source graphics set that would render the distinction moot. I thought about having the option to toggle between original graphics (without inversions) and a custom set which has them, but I don't know if the devs would merge that. Select "disable clearance checks" from the cheat menu. This will let you place objects that overlap with other objects. It has a similar effect to 8 cars zero clearance, but it's less likely to cause undesirable side effects because it does not actually modify the clearance values like 8 cars does. Note that doing this can still have unexpected side effects, especially when you are overlaying multiple tracks on top of one another. However, what's depicted in the picture should work. If you are overlaying track for decorative purposes, building th decorative track in the opposite direction will prevent interference. To the best of my knowledge, there isn't, and it would be completely pointless because anything you could do with a trainer would me much better implemented as a cheat. Not having to use trainers is one of the advantages of OpenRCT2 - if there's a feature that a trainer implements but OpenRCT2 doesn't, you can implement it and submit a PR. There's not much reason to do that with OpenRCT2 since the game has the option to turn off clearance checks (note that OpenRCT2 players often refer to this feature as "zero clearance" but it does not actually modify clearances; it just ignores them). If you actually need to set clearances to zero, I don't think there's currently a way to do that in OpenRCT2.